A group of us always go somewhere fancy for a Christmas get together. This year we booked Number One back in February on the basis that we’d have saved our pennies by Christmas (ha!). A little steeper than tasting menus at some other Michelin starred restaurants, we hoped for something special. We were warmly greeted by staff who promptly took our coats and offered us the choice of a drink first or going straight to our table for dinner. We chose the latter. The dining room had a nice Christmassy feel and the lighting was low. We were led to a table in the middle of the room. To my surprise, the place wasn’t full and remained under capacity all evening. This really shouldn’t be the case for a Saturday in December at a starred restaurant. We had already decided to go for the winter tasting menu but my friends talked each other into matching it with wines. We started off with some amuse bouche, presented on a lovely stand. This included three bites of food; one lobster, one beef and one cheese. Opinion was split on which one was best as we all had a different favourite. Mine was the lobster. They were all delicious though. Afterwards, the sommelier came to talk about the first wine, and introduced each wine with the relevant course as it came out. He spoke confidently and humorously throughout. We then started on the first course of the menu, West Coast crab with mango and avocado. This was a light and delicate dish and almost palate cleansed in preparation for the next course. Next followed the Balmoral’s signature dish, smoked salmon with lemon purée and quails egg. Our plates arrived under smoked closhes, which were lifted at the same time to allow the smoky aroma to waft across the dining room. The salmon was of high class and a generous portion. The small dots of lemon purée were a lovely addition along with slices of radish and apple. The quails egg oozed appropriately. A delightful course and the favourite for one of the group. Fois gras followed. I always feel slightly uneasy with this as a dish and would never order it from an a la carte menu. My fellow diners felt the same. However, we weren’t going to waste a course put in front of us. There is no denying that it was delicious. The accompanying quince and pistachio were beautiful. This course also came with gingerbread. We found this a little too crumbly and sweet for this course (although we obviously ate it all anyway). They didn’t clear up the crumbs it left, as it was served in a napkin on the tablecloth, which I found surprising for a Michelin starred restaurant. The fish course was halibut. The fish was possibly slightly over cooked but only a smidgen or so. It sat on a bed of cucumber. I am not a fan of this vegetable but it did seem that is made the cucumber a bit mulchy, which made it even less appealing. The seaweed was nice but the oyster felt a bit overkill, almost as if it was there to be opulent rather than for the benefit of the dish. There was a surprise addition of what we think was puffed rice on top of the fish. It certainly added another texture to the plate. Then for the meat course, which was Tweed Valley beef fillet. This meat was of excellent quality and melted in the mouth. The accompanying beef short rib was packed full of flavour. The salsify was great and the little risotto underneath was tasty. One of my friends felt the dish could have taken a little more of the horseradish, but that was the only criticism. This was definitely my favourite course. We then entered the dessert zone. First came the brown butter financier. Balanced on top was a muscovado chantilly cream and small cubes of apple were scattered around the plate. This was a pleasing dessert. The apple balanced out the sweetness well with its sharpness. It felt naughty without being over-rich. Second dessert was the impressive vanilla soufflé and ice cream sandwich. As hoped, the soufflé had risen nicely. Sadly, I think it was a touch under done as it still tasted a bit eggy. The ice cream sandwich was a delight though. The ice cream itself was beautifully smooth and the biscuits tasted like Oreos, so what’s not to love? We were lastly offered a petit four from a trolly full of them. There were four to choose from but one seemed a bit stingy compared to other places. Nevertheless, they were of a great quality and rounded off the meal well. Sadly we had to wait ages to get the bill. I don’t mind restaurants not hurrying you out but as we were all sat there with no drinks, not being offered even a drink felt a bit foolish on their part. I might have considered a cocktail but by this time we decided that it was time to call an end to the evening. Number One at the Balmoral definitely had elements of deliciousness but it didn’t offer anything wow. We felt a little underwhelmed by our experience but still enjoyed the meal overall. Would I eat here again? Unlikely as there are better offerings in the capital. £423 for three tasting menus, two with matched wines. Opening up recently as a progressive Italian restaurant from the people that brought you the much loved Atelier, Mono is situated on South Bridge. The restaurant is laid out over 2 floors. They keep the ground floor for lunches, afternoon tea and arrival drinks and the lower level for evening dining with a view into the open kitchen. Unfortunately this meant that we had to wait until someone realised we had arrived. I do worry this will not work well for walk ins but believe me, it will be worth it if you hang around. After having a drink upstairs, we were led down to our table. We started our gastronomic journey with three amuse bouche. These provided a wealth of textures and flavours and were a good introduction to the rest of our meal. Whilst we waited for our first course to arrive, we were brought an assortment of bread, which was made on side. This came with a dish of glossy golden olive oil. This all had wonderful flavour, with the focaccia being my favourite. Our first course was octopus alla piastra. This had a tentacle, laid on a bed of chickpeas and sultanas, with nduja and sea herbs and a couple of crispy elements which then had a delicious sauce added to it. This had a really interesting combination of flavours which were really tasty. Wood pigeon was the next course, which I love. This has to have been the best wood pigeon dish I’ve ever had (and I’ve eaten it at Heston Blumenthal’s Dinner). The pigeon sat on top of offal, lentils, lardons and capers. Unusually, it was topped with smoked honeycomb, which weirdly worked. This whole dish was sublime. Next up was aged Parmesan pasta. The pasta popped in the mouth with gorgeous Parmesan sauce. Nestled in with the pasta were little egg yolk balls which had a breadcrumb coating which were wonderfully rich and was topped off with white asparagus. A corker of a dish. Could the next dish keep up the impressive level of cooking? Yes! This time it was salted cod. The delicately tender fish sat with polenta and vivid green strips of asparagus. Broad beans and peas scatted the plate along with some artichoke and was topped off with a luscious mugnaia sauce. A light, fresh dish. Gorgeous. Dry aged beef followed. This beautiful cut of beef was perfectly pink and came with ox cheek. Kohlrabi, cauliflower and hazelnuts were placed across the plate, with rings of shallot and a smattering of sea truffle. The puree was incredible smooth and the sauce beautifully velvety (and bonus for leaving a small jug of it on the table just in case). All I can say is wow. The next course was a cheese course but technically a dessert. I think this may be a dish that may be difficult to get for some people but we surprisingly enjoyed it. It was a combination of Gorgonzola and chocolate. A mouse was made combining milk chocolate with the cheese. This gave it a tangy flavour. A white chocolate dome filled with more cheesiness sat alongside a Gorgonzola sorbet, which was actually my favourite bit. This was all accompanied by a dark chocolate and hazelnut soil and cherries. This dish was confusing but clever at the same time. Onto a slightly more straightforward dessert – Perthshire strawberries. The strawberries were soaked in vodka and were nestled alongside and strawberry and pine sorbet. Ricotta balanced out the sweetness to make this a very pleasant dish. Lastly we had coconut semifreddo. The semifreddo was encased in bramble. Alongside was a coconut crumb, brambles and the most interesting element – Thai green curry sorbet. It’s main flavours were ginger and lemongrass but it did just taste exactly like a Thai green curry. Even stranger, it worked as part of the dessert. A couple of the dishes might challenge some palates but we loved the lot. There was some really exemplary cooking here. The table service was also top notch. We thought Atelier couldn’t be topped. We were wrong. Go here and go here soon. Cost – we had a special deal as former Atelier customers of £60pp for the tasting menu but the standard price would be £75 plus £15 for the glass of wine. Chef Scott Smith announced in April that he was leaving Norn to set up a new place. Around a month later, Fhior opened up on Broughton Street and we nipped in on a Friday night on the off chance there was a table, which there was (I doubt that will last for long). We were seated by a window looking out into a little back garden. It was nice to get some natural light on the table in these light evenings. There was a choice of a four or seven course tasting menu. We decided to throw caution to the wind and plump for the seven course option. We were brought out some bread and some coppa to start off. Those delicious slice of pork was great to stave off the stomach rumbles until our first course arrived. The first course was a little bowl with some small mackerel pieces in it sitting in some liquor. This was a refreshing taste and a really pleasant start to the meal. We then received a beautiful halibut dish. This came with Swiss chard and salt marsh herbs. The fish was cooked perfectly and flaked delicately. The light sauce pulled the whole thing together well. The next course was slightly unusual with the pairing of prawn with rhubarb but weirdly it worked. Again, the exquisitely designed plate of food was delicious. The prawn was particularly plump and juicy. I love a bit of asparagus as well as garlic, so the next course was right up my street. Asparagus was matched with spruce, wild garlic and wood sorrel. The delicacy of the flavours worked in harmony and created a lovely summery flavour. Next up was baby gem lettuce, hogget, peas and goats curd. This was a whole piece of charred baby gem lettuce with hogget scattered through it. Again another really great dish, although I found the end of my lettuce a little unappetising so left it. The last of the savoury courses was chicken with mushroom, barley and lovage. The chicken had been cooked sous vide and was wonderfully moist as a result. The mushrooms complemented the barley and the lovage purée drew the elements together. The whole thing was satisfying. The first of our two desserts arrived in the form of strawberries, with a woodruff ice cream and rapeseeds. Neither of us had tried woodruff ice cream before and were pleasantly surprised. This served as a more substantial palate cleanser. The last course of the evening was a chocolate one. It came as white chocolate, beremeal and seaweed. Whilst reading the list, you might not be attracted to this dessert but it was an absolute corker. The flavours and textures felt like they were made for each other. As we wrapped up our meal, we were given a raspberry each on a spoon. I thought this was a much nicer way to end the meal than a mint but was even more surprised as I popped it in my mouth as it was warm and almost liquid. It was the perfect end to what was a delightful meal. The staff at Fhior were knowledgeable and friendly and the whole place had a more relaxed atmosphere than Norn. Fhior is a place to enjoy and savour. Check it out. I hadn’t been to Castle Terrace for over three years, but it had been a firm favourite of mine. With such a big gap, I still somehow managed to visit the restaurant twice in a week – once for lunch and once for dinner. It is the dinner I will be reviewing because I think it put them through their paces more. This was part of my birthday celebrations so we already knew we were all in on the tasting menu (because why wouldn’t you?!). On arrival we were warmly greeted and had our coats taken in exchange for a cute little charm, so we could claim them back later. We were immediately taken to our table, even though we had arrived a little early, which suited us fine. We noticed later that other people were given stools for their handbags. We were not. I had this happen at the Kitchin too. I don’t know why our handbags were fine to be left on the floor but others not. My poor handbag has now developed a complex. We were only given drinks menus to start, which we found a little frustrating as we hadn’t indicated at that point that we were choosing the tasting menu, so those drinking wine had no idea what the cost of a paired wines option was or if they had gone for the a la carte menu, what they might be eating so to choose an appropriate wine. This resorted in them not going for the matches wines option, which undoubtedly cost the restaurant some profit. I chose a cocktail – Scottish Rose. I was horrified on its arrival that it had a slice of cucumber in it. I should have guessed as the cocktail had Hendricks gin as an element but it also has Cointreau and rose water. Anyway, I scooped it out and left it on my side plate. We were brought some amuse bouche which consisted of a goats cheese, apricot and pork collar, salt cod barbajuan and a Caesar salad. These were delightful on the eye (a recurring theme), with the goats cheese canapé looking like a mini eggs and bacon and the Caesar salad a vivid green hue, which had to be popped in your mouth in one go as it was in fact liquid inside. All lots of fun but still packing in some serious flavour. Some bread was also brought to the table with some salted butter. The bread was warm, with a crunchy exterior. It would have been nice if they had offered to take away my slice of cucumber (from the aforementioned cocktail) so I could use my side plate properly but that didn’t happen. It just glared at me as I scooted my bread around the remainder of the plate. We ordered the surprise tasting menu and stipulated dietary requirements. We then waited for what was quite a long time before we had the next lot of food. The appetiser arrived a good 45 minutes after we entered the restaurant. This was the only real wait we had but it wasn’t a great start. The appetiser was a panna cotta of Arbroath smokie. It was clever as it looked like an egg but the yolk was mango. A smart idea which really tricked the mind. The smokiness came through well too, so it wasn’t all style and no substance. The next course was tartare of Shetland salmon, served a little like sushi. The salmon was exquisite and had sesame seeds scattered across it. Placed delicately on top was a small quenelle of wasabi ice cream. I love wasabi ice cream so revelled in eating that. There were also small cubes of soy sauce jelly, alongside slivers of ginger and cucumber (or courgette for those who disliked cucumber). The textures and flavours were executed to perfection in this dish. I really had to restrain myself from gobbling it all up too quickly. Next came a seared wing of skate, served with a light curry sauce. The skate had a beautiful golden colour to its top, which provided a lovely taste and texture. A little bit of coconut was scattered on top. To its side were some dehydrated grapes and apricot, a celeriac purée topped with a crispy shallot, and a mini naan. Every single mouthful danced on the palate. The curry sauce, whilst light, was still thick and had a mild heat running through it. I was tempted to lick the plate. The next dish was very clever indeed. It was presented to us as a pork burger but nothing was quite what it seemed. The meat component was a patty of pork, but with additional elements inside. The bun was actually made of chickpea. It was astounding that this still managed to not just look like but also have the texture of bread. There was a slice of ketchup but in jelly form and what looked like some cheese was in fact turnip. It seemed only the lettuce leaf was wearing its true identity. The whole thing came with a pork jus. Utterly delicious. The fish course was probably one of the least memorable of the evening. That isn’t to say that it was bad – it just didn’t stand out as much. It was a cod dish and had been poached, with a minestrone of vegetables sat on top with a crab ravioli. A crab bisque was then poured over the top. The fish was soft and the bisque was velvety. A solid course, just a bit uninspiring after the previous dishes. Onto the meat course. This was a spelt risotto with various beef elements on top. I first had a spelt risotto here several years ago and fell in love with it. I’ve yet to have a spelt risotto as good and was as tasty as I remembered it. On top was heart, beef slices and oxtail. Each element was packed with flavour and was quite a rich dish and felt quite opulent but somehow homely at the same time. One of my friends described this course as spectacular. Lastly came the dessert. This was an apple and mascarpone cheesecake. A swirl of caramelised sesame seeds sat on top with a slice of confit lime and apple sorbet. This was not too heavy for dessert and the flavours were relatively subtle, apart from the confit lime which was quite tart and make me pucker up. One of the staff was fiddling around in opening a bottle of wine for the next table at a little side table between us and them. Whilst he did this he encroached on my friend’s space while she was trying to eat, with his side rubbing up against her arm. This isn’t a good set up at all and needs to be adjusted. My friends ordered an espresso and a breakfast tea, which arrived with petit fours for us all. My friend who had chosen tea wasn’t offered milk, so had to ask for it, which yet again was a little disappointing. The petit fours were cute and tasted nice though but not as fun as the amuse bouche at the beginning of the meal. I know from what I’ve written sounds as if I didn’t have a great time but that’s not true. Overall, I did enjoy the experience but it wasn’t as good as times gone past. The food was excellent but elements of the service took the shine off it. At another restaurant I wouldn’t have found such things annoying but at this standard of restaurant, there is more scrutiny. My friend also found some of the insistence of the sommelier a little pressurising, particularly as they had already made their choice. As an aside, my lunch experience was different because I went with someone who was a regular and was recognised by all the staff – plus it wasn’t busy. This shouldn’t really impact on the experience. Perhaps this is why they lost their Michelin star. Would I eat here again? Yes but I’d probably pick the Kitchin instead. 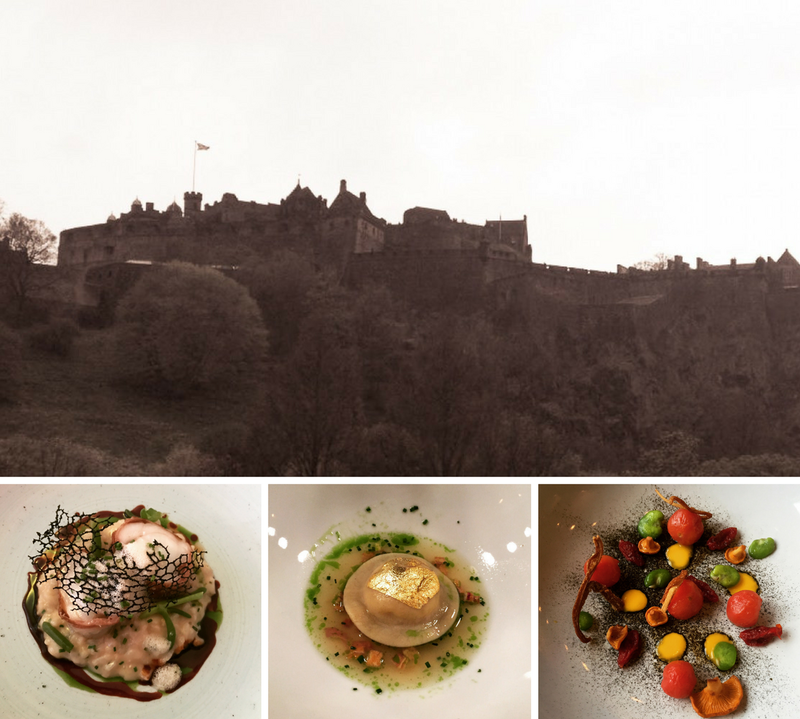 Lovage is quietly situated just off the Royal Mile on St Mary’s Street. Lovage’s menu is relatively short but offers some exciting delights, leaving both my dining companion and I undecided about which options to go for. In the end, I chose the salmon to start followed by the hake. My friend opted for the pork belly followed by the parmesan risotto. Whilst we were waiting for our starters to arrive, we were brought some gorgeous warmed bread which we virtually inhaled. The starters followed shortly after and were beautifully presented. My dish was 37 degrees Celsius Scottish salmon, served with a sweet chilli sauce, celeriac and a lemon crust. The salmon was absolutely beautiful. It separated easily and the sauces complemented without being overpowering. There was even a scatting of samphire, which was a bonus as I love it. The dish managed to be light but with substance. On the other side of the table, the pork belly was also going down well. This was accompanied with an unusual choice of rhubarb but worked well. The plate also consisted of potato puree, cumin jus and cavolo nero. All the elements were harmonious. The only complaint was that the dish made it a little difficult to eat as all the ingredients were served in the small well in the centre of the plate. On the plus side, this did ensure that she ate all the ingredients together, which meant she probably experienced the dish at its optimal level. The mains continued with the superb level of presentation. My hake sat in a vivid green pea soup, with asparagus, confit potatoes, a hollandaise sauce and some lemon crème fraiche. The fish was cooked to perfection, flaking effortlessly. The pea soup packed in some strong flavour, with both the hollandaise and crème fraiche adding further dimensions. This was a thoroughly pleasing plate of food. On the other side of the table, the parmesan risotto looked good. The top was scattered with mushrooms and walnuts, which helped give the risotto additional textures (as a bowl of plain risotto can become a bit too same-y). The truffle oil also added some luxury. For those who are vegetarian, they can make this a vegetarian dish for you if you were interested in. My friend sacrificed some of her risotto in order to fit in dessert (I had no such problem in scoffing my chops with the fish). I went for the chocolate cremeux and my dining companion chose the strawberry cheesecake. Again, these were both lovely looking plates of food. My cremeux made a good crunch on top as I broke into it, with my spoon then sliding down through a creamy layer to reach a delicious chocolate sponge. Each layer was as tasty as the next. Alongside the cremeux was a smooth banana ice cream. I am not usually a big fan of banana flavoured things but this really worked, particularly as there were also orange segments and gels dotted on the plate. This resulted in a very balanced dish. My friend also enjoyed her strawberry cheesecake. The cheesecake had a layer of strawberry jelly on top and was accompanied by black pepper meringue (which she loved) and a basil sorbet (which she was less keen on as it was a bit too overpowering in basil flavour). I have to say I tried a bit of the sorbet and thought it would be a really nice starter with some tomatoes and cheese. Overall, Lovage produced some top notch food. The vibe in the restaurant was relaxed, with a jazz playlist playing soothingly in the background. It is certainly worth a visit. Cost – £78 for two lots of three courses plus one large and one small glass of wine. A few of us get together every Christmas and have a lovely meal somewhere. We decided we wanted some Michelin starred goodness, so got ourselves along to Kitchin. I hadn’t been to Kitchin since it had it’s refurbishment and it have to say it’s looking lovely. On arrival our coats and bags (full of exchanged Christmas presents) were taken and we were given a key in exchange so we could collect everything quickly on our exit. We arrived a little early so we were shown to the bar area to have some drinks, nibbles and peruse the menu. The bar area was warm, with a fire going and the seating was sumptuous. We orders some cocktails and we’re given some crisp breads with a cheese dip. We even got some cute little pop out hand towels as one of the crisp breads had a sticky coating. The crispbreads were tasty but not too filling. Just enough to keep you going until you were eating at your table. We were shown to our table, passing the kitchen (where you could see Tom Kitchin at the pass) to find ourselves pleasantly nestled in a nice corner. We had decided to choose the seasonal tasting menu and immediately started salivating. Whilst we waited for our first course to come out, we were presented with little maps showing where food from the menu was sourced. We also had a small loaf of bread for the table to share. This was light, with a superb crust. When we tore it open, steam rose up and the butter melted perfectly on the soft bread. There was a small problem of the lace on the sleeves of my dress catching on the place mats – they need to sort that out! Firstly we were given our amuse bouche, which was cold carrot veloute with ginger, lime and apple, with delicately small pieces of vegetables scattered on the top. I love a veloute but had never had a cold one. I am pleased to report that it was delicious. You could taste every element; nothing was lost. A great start. Then we moved onto mackerel tartare with winkles, brown shrimp, seaweed and croutons. This was a strong flavoured dish, which may not be to everyone’s taste but we lapped it up. They cleverly used the seaweed to help season the dish. Everything on the plate was miniature, including the incredibly tiny croutons. Around the outer rim of the dish was ice, to keep the fish at a cool temperature. It served as an attractive setting too. A solid dish. Then, I was excited to see the next dish was sweetbread. I had sweetbreads a few years ago at Kitchin and had not had the opportunity to have them again since. They were absolutely divine (and a highlight for me). Alongside the sweetbreads were ox cheek, bone marrow, onion, onion purée, assorted nuts and veal jus. Every element on this dish sung. The bone marrow melted on the tongue. The onion elements brought everything together. It was just a shame the serving size meant I couldn’t savour it for long, but needs must on a tasting menu. Next, we moved onto the fish course of sea bass, cauliflower purée, cauliflower florets, mussel, shrimp and an emulsion of vegetables, wine and butter. This was beautifully plated. The fish was cooked to perfection, flaking easily. The purée and emulsion worked together very well and unified the dish. We then had hare with hare cannelloni, beetroot, beetroot purée, root vegetable purée, apples, carrot, sprout and topped off with a hare sauce. I’d not had hare before and I think was closer than venison that rabbit. It had a wonderful gamey flavour. The cannelloni was nice, using more hare as part of the filling. The vegetables and purée added a lovely complimentary flavour. We then had a palate cleansing pre-dessert of blackcurrant sorbet, yoghurt mousse, homemade granola and apple and blackcurrant compote. The flavour of the sorbet was very strong and sharp. However, the yoghurt mousse balanced it out perfectly. The crunch of granola added enough texture. Our final course – dessert – was plum crumble soufflé with vanilla ice cream. This was amazingly light. There was rise above the rim of the dish, which is always pleasing to see. The plum compote was lovely, not being too sweet or too sharp. The accompanying vanilla ice cream was just the right consistency and worked well with the soufflé. We had tea and petit fours and then departed, feeling very satisfied. Would I eat here again? Yes, as soon as the bank balance will allow! Cost just over £330 for three tasting menus, three cocktails and a bottle of wine.